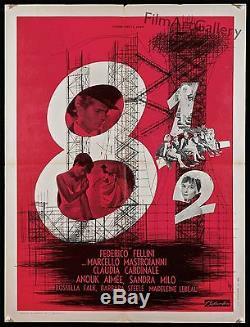 Original, first release French film poster is for the 1963 Federico Fellini classic "8 1/2", starring Marcello Mastroianni, Barbara Steele, Claudia Cardinale, Anouk Aimee. Great artwork - only used in France! The poster measures 23 1/2" x 31 1/4" inches and the condition is fine/very fine, folded as issued with small fold separation at top border, minor wear and toning around fold lines and borders but no major flaws. Overall very nice, especially for a 50 year-old poster! NOTE: PLEASE IGNORE THE BLACK MAGNETS IN THE CORNERS: THEY ARE USED DURING THE PHOTOGRAPHIC PROCESS AND AREN'T PUSHPINS, HOLES OR A DESIGN ELEMENT. PLEASE SEE OUR OTHER AUCTIONS AND STORE ITEMS FOR COOL MOVIE POSTERS. FILM/ART has one of the finest collections of original movie posters. It must come back in the same condition as it was sent. The item "8 1/2 original 1963 French 23x31 poster Federico Fellini Filmartgallery" is in sale since Monday, December 01, 2014. This item is in the category "Entertainment Memorabilia\Movie Memorabilia\Posters\Originals-International\1960-69".